In the Dirt: Slammin into New York? New York Mets GM Omar Minaya wants to acquire the same 16-year old he signed out of the Dominican Republic 22 years ago, Sammy Sosa. Sosa has so far had an impressive return since a disappointing 2005 season followed by sitting out an entire year. Two years ago he signed with the Orioles and had an inadequate season, limited power, and was injury riddled. 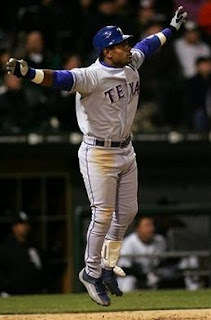 Now with the Texas Rangers he is a leading candidate for Come Back Player of the Year. His batting average may be a bit low but he has been showing power, but what makes him a very attractive player is his $500,000 contract he signed. At the time Rangers GM was criticized but Sosa has proved to be valuable and not at all like the player he was just before leaving the Cubs. "There was some skepticism about why he was coming back and things like that, but he's been outstanding in the clubhouse and been a very good teammate. The things people heard about him at the end of his tenure with the Cubs, there's been no indication of that. He's been a team-first guy and a good role model to the younger players,” Rangers GM Jon Daniels said in Newsday. The Mets are in the market for a corner outfield threat. Shawn Green has been adequate but has only supplied the team with seven homeruns. Meanwhile Moises Alou has been on the DL since May 13th and only has 110 at bats this season. They would like to upgrade but in this market it makes little sense. There are more buyers than sellers and teams looking to deal are expecting a lot in return. So until the market changes the Mets are hoping Green can produce and Alou can make a quick comeback the Mets are willing to wait out the market. If teams looking to deal come down in price or the Mets get desperate keep an eye on Minaya’s old friend. The only way this deal makes sense to for the Mets is if Alou doesn’t come back strong or at all. It doesn’t make sense to give up much for an end of the season rental player especially on a player batting .239.